Look out, Qik, FaceTime (s aapl) and Tango! 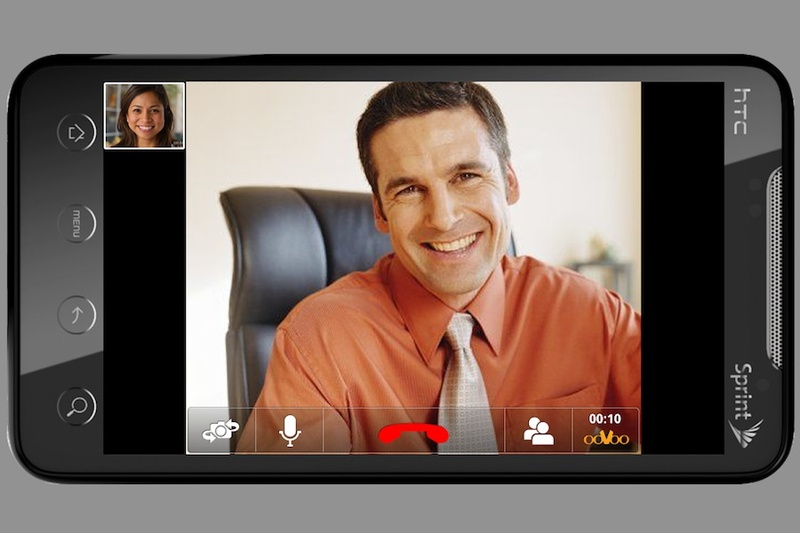 A new mobile application from video chat startup ooVoo aims to provide high-quality, multi-user video chat across mobile networks. With Wednesday’s launch of new Android (s GOOG) and desktop apps, ooVoo will let users communicate with up to six different video chat partners, even over today’s 3G wireless networks. So how does ooVoo do it? Unlike other point-to-point video chat applications, its service doesn’t depend as much on the device or the network; instead of relying on the handset’s processor, ooVoo shifts the heavy lifting of video encoding and processing to the cloud. As a result, the underpowered processors of most mobile devices don’t get overloaded and slow down while the application is running, and the video is sent and displayed pretty seamlessly. While ooVoo has been providing video chat services on the desktop over the last several years, mainly competing with apps like Skype, the mobile market provides a new opportunity. But the mobile video chat market is becoming crowded — and fast. With the introduction of front-facing cameras on mobile devices like the iPhone 4 (s AAPL) and Android handsets like the HTC Evo and the Samsung Epic, a number of app developers have sprung into action to enable video chat on those devices. Apple released its FaceTime application earlier this year, but startups like Qik and Tango have also been quick to make video chat available on Android phones. And rumor has it that Skype is hiring mobile developers — possibly to port its video chat capabilities to iOS and Android phones. Even so, ooVoo’s advantages — like high-quality and multi-user chat — should bode well as it competes against apps like Tango and Qik. And ooVoo’s CEO Philippe Schwartz says the service’s cloud-based architecture could help it bridge the divide between multiple fragmented video chat apps available today. Because video processing happens in the cloud, it’s not a problem for ooVoo to translate video sent by desktop or mobile apps from other providers into a format supported by its own apps, or vice versa. Android isn’t the only ecosystem that ooVoo hopes to conquer; Schwartz says the company hopes to have an iOS app available by February (just in time for the iPad 2 to be announced? ), and it is also looking to have its application available on connected devices like TVs in the future. In the meantime, the company is well positioned to reap the benefits of the explosion in mobile video chat. Er… what? Come on Ryan, let’s try to think critically instead of regurgitating marketing drivel. I’m just a layperson that enjoys technology, but this statement just seems mutually exclusive. Bandwidth and processing power are always at odds when it comes to video: the reason why we have processor-intensive video compression in the first place is because we have space and bandwidth limitations. We cannot store or transmit/receive uncompressed quality video. If we take the processing power to shrink down video such that quality isn’t dramatically impacted, then that requires processing power. One or the other has to give. Either we are sending raw, uncompressed video to the cloud (so that the cloud can compress?) — which will heavily depend on the network, or we are sending compressed video, which requires processing power. Am I missing something obvious or is this more marketing bs? Kudos to ooVoo for their upcoming launch of multi-party video calling. However, the video comparison to Qik is not a valid comparison. The Qik Video Chat shown is happening between two mobile devices, whereas the ooVoo chat is happening between a mobile device and a desktop which will deliver much clearer video. We looking forward to running an apples-to-apples comparison once the ooVoo app hits the market. Can’t wait to try. Love video chatting on fring. How does it compare?